Natrapel 8 hr continuous spray protects against all biting insects. Out of every six people in the US, at least one will get sick in their lifetime from eating contaminated food. Food safety is so important nowadays because there are so many public places to partake in a meal. If the proper procedures are not followed, it can affect many people. The most recent foodborne outbreaks have been linked to the following foods: frozen vegetables, Raw Milk, Pistachios, and Alfalfa sprouts. These outbreaks have been as small as affecting a small population or as large as spreading to multiple states. The CDC plays a large role in preventing foodborne outbreaks by linking illnesses to certain foods, tracking illnesses, and assembling teams to investigate and prevent outbreaks from happening. 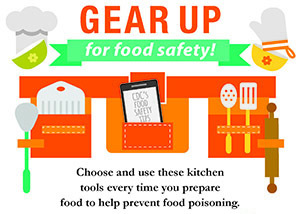 Read on for some helpful tips to help you prevent foodborne illnesses. Tuberculosis is an airborne disease. It is only spread when germs are forced into the air. Covering your mouth when you sneeze or cough, is not only polite but reduces the risk of contracting and/or spreading the disease. The best and most effective way to avoid contracting TB is to avoid being in the same vicinity as someone who has TB. However, if this is unavoidable, wear a mask that covers the nose and mouth. Gloves and protective clothing are not required, as TB cannot be transmitted through touch alone. Please click Read More for a list of TB Symptoms.